Not Polite Dinner Conversation – Anyone remember Robertson’s claims about God telling him who will be president? no idea the origin of this. thank you creator of this image. Well, I didn’t get one of my prophecies right. Obama won pretty handily. Poor thing. He’s got nothing more than his usual lies based on fear and greed. I am doing rather well, 50% right. So make with the cakes and beer if you want my “blessings”. 😉 (if I had to choose a god to worship, Sekhmet would be it). “I think He showed me about the next president, but I’m not supposed to talk about that so I’ll leave you in the dark — probably just as well — but I think I know who it’s gonna be.” You can watch it right here. And an article about Pat’s nonsense was on Huffington Post here. 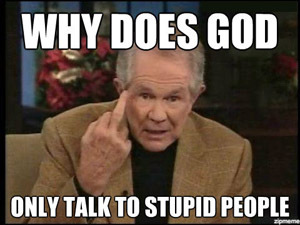 Of course we always have the weasel words, so Pat can claim that he was wron g but his god wasn’t. But we know that Pat was sure that he knew (or that he knew he was lying, such a nice choice there: delusional or a liar). God sure gots it wrong. Or Patty is lying. Again. Next Post What the Boss Likes – Big Trouble in Little China and Lo Pan Style!